: Kannada Movie ‘Amma I Love you’ is a tribute to all the Mothers from Dwarakish Productions. Tickets have been available online since Wednesday 18th July. You can avail special discount on the ticket fares on Monday. 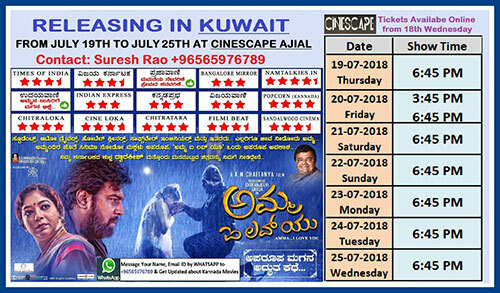 The Kannada and Tulu film Distributor to Kuwait are earnestly requesting you to watch the movie and support Kannada film industry.